In physiology, a stimulus (plural stimuli or stimuluses) is a detectable change in the internal or external environment. The ability of an organism or organ to respond to external stimuli is called sensitivity. 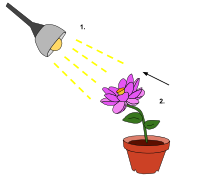 When a stimulus is applied to a sensory receptor, it normally elicits or influences a reflex via stimulus transduction. These sensory receptors can receive information from outside the body, as in touch receptors found in the skin or light receptors in the eye, as well as from inside the body, as in chemoreceptors and mechanoreceptors. An internal stimulus is often the first component of a homeostatic control system. External stimuli are capable of producing systemic responses throughout the body, as in the fight-or-flight response. In order for a stimulus to be detected with high probability, its level must exceed the absolute threshold; if a signal does reach threshold, the information is transmitted to the central nervous system (CNS), where it is integrated and a decision on how to react is made. Although stimuli commonly cause the body to respond, it is the CNS that finally determines whether a signal causes a reaction or not. Homeostatic imbalances are the main driving force for changes of the body. These stimuli are monitored closely by receptors and sensors in different parts of the body. These sensors are mechanoreceptors, chemoreceptors and thermoreceptors that, respectively, respond to pressure or stretching, chemical changes, or temperature changes. Examples of mechanoreceptors include baroreceptors which detect changes in blood pressure, Merkel's discs which can detect sustained touch and pressure, and hair cells which detect sound stimuli. Homeostatic imbalances that can serve as internal stimuli include nutrient and ion levels in the blood, oxygen levels, and water levels. Deviations from the homeostatic ideal may generate a homeostatic emotion, such as pain, thirst or fatigue, that motivates behavior that will restore the body to stasis (such as withdrawal, drinking or resting). Changes in pressure caused by sound reaching the external ear resonate in the tympanic membrane, which articulates with the auditory ossicles, or the bones of the middle ear. These tiny bones multiply these pressure fluctuations as they pass the disturbance into the cochlea, a spiral-shaped bony structure within the inner ear. Hair cells in the cochlear duct, specifically the organ of Corti, are deflected as waves of fluid and membrane motion travel through the chambers of the cochlea. Bipolar sensory neurons located in the center of the cochlea monitor the information from these receptor cells and pass it on to the brainstem via the cochlear branch of cranial nerve VIII. Sound information is processed in the temporal lobe of the CNS, specifically in the primary auditory cortex. ^ Prescriptivist’s Corner: Foreign Plurals: "Biologists use stimuli, but stimuluses is in general use." ^ a b Craig, A D (2003). "A new view of pain as a homeostatic emotion". Trends in Neurosciences. 26 (6): 303–7. doi:10.1016/S0166-2236(03)00123-1. PMID 12798599. ^ Stucky, C. L.; Gold, M. S.; Zhang, X. (2001). "From the Academy: Mechanisms of pain". Proceedings of the National Academy of Sciences. 98 (21): 11845–6. doi:10.1073/pnas.211373398. PMC 59728. PMID 11562504. ^ a b c d e "Absolute Threshold". Gale Encyclopedia of Psychology. 2001. Retrieved July 14, 2010. ^ Botstein, David; Ball, J. Michael; Blake, Michael; Botstein, Catherine A.; Butler, Judith A.; Cherry, Heather; Davis, Allan P.; Dolinski, Kara; Dwight, Selina S.; Eppig, Janan T.; Harris, Midori A.; Hill, David P.; Issel-Tarver, Laurie; Kasarskis, Andrew; Lewis, Suzanna; Matese, John C.; Richardson, Joel E.; Ringwald, Martin; Rubin, Gerald M.; Sherlock, Gavin; Sherlock, G (2000). "Gene ontology: Tool for the unification of biology. The Gene Ontology Consortium TEGAN LOURENS". Nature Genetics. 25 (1): 25–9. doi:10.1038/75556. PMC 3037419. PMID 10802651. ^ Janmey, Paul A.; McCulloch, Christopher A. (2007). "Cell Mechanics: Integrating Cell Responses to Mechanical Stimuli". Annual Review of Biomedical Engineering. 9: 1–34. doi:10.1146/annurev.bioeng.9.060906.151927. PMID 17461730. ^ Ingber, D. E. (1997). "Tensegrity: The Architectural Basis of Cellular Mechanotransduction". Annual Review of Physiology. 59: 575–99. doi:10.1146/annurev.physiol.59.1.575. PMID 9074778. ^ Nakamura, Tadashi; Gold, Geoffrey H. (1987). "A cyclic nucleotide-gated conductance in olfactory receptor cilia". Nature. 325 (6103): 442–4. doi:10.1038/325442a0. PMID 3027574. ^ Eccles, J. C. (1966). "The Ionic Mechanisms of Excitatory and Inhibitory Synaptic Action". Annals of the New York Academy of Sciences. 137 (2): 473–94. doi:10.1111/j.1749-6632.1966.tb50176.x. PMID 5338549. ^ Pitman, Robert M (1984). "The versatile synapse". The Journal of Experimental Biology. 112: 199–224. PMID 6150966. ^ English, Arthur W; Wolf, Steven L (1982). "The motor unit. Anatomy and physiology". Physical Therapy. 62 (12): 1763–72. PMID 6216490. ^ Baylis, PH (1987). "Osmoregulation and control of vasopressin secretion in healthy humans". The American Journal of Physiology. 253 (5 Pt 2): R671–8. PMID 3318505. ^ Goligorsky, Michael S. (2001). "The concept of cellular 'fight-or-flight' reaction to stress". American Journal of Physiology. Renal Physiology. 280 (4): F551–61. doi:10.1152/ajprenal.2001.280.4.f551. PMID 11249846. ^ Fluck, D C (1972). "Catecholamines". Heart. 34 (9): 869–73. doi:10.1136/hrt.34.9.869. PMC 487013. PMID 4561627. ^ Power, Michael L.; Schulkin, Jay (2008). "Anticipatory physiological regulation in feeding biology: Cephalic phase responses". Appetite. 50 (2–3): 194–206. doi:10.1016/j.appet.2007.10.006. PMC 2297467. PMID 18045735. ^ Giduck, SA; Threatte, RM; Kare, MR (1987). "Cephalic reflexes: Their role in digestion and possible roles in absorption and metabolism". The Journal of Nutrition. 117 (7): 1191–6. PMID 3302135. ^ Ionac, Mihai; Jiga, A.; Barac, Teodora; Hoinoiu, Beatrice; Dellon, Sorin; Ionac, Lucian (2012). "Hindpaw Withdrawal from a Painful Thermal Stimulus after Sciatic Nerve Compression and Decompression in the Diabetic Rat". Journal of Reconstructive Microsurgery. 29 (1): 63–6. doi:10.1055/s-0032-1328917. PMID 23161393.